There are two types of hospital wastes. Risk waste is further subdivided in seven (07) groups. Cultures (the growing of microorganisms in a nutrient medium (such as gelatin (Proteins from bone & skin) or agar) from laboratory work. Waste from surgery and autopsies (post-mortem). Any material having been in contact with infected patients. Expired or unused pharmaceutical products. Spilled or contaminated pharmaceutical products. Surplus drugs, vaccines or sera. Discarded items used in handling pharmaceutical, for example bottles, gloves, masks, tubes. Cytotoxic drugs and outdated material. Vomiting, feces or urine from patients treated with cytotosic drugs or chemicals. Contaminated materials from the preparation and administration of the drugs such as syringes, vials (A bottle that contains a drug (especially a sealed sterile container for injection by needle) etc. House keeping and disinfecting procedures. Mercury waste such as from broken clinical equipment spillage. Cadmium waste, mainly from discarded batteries. 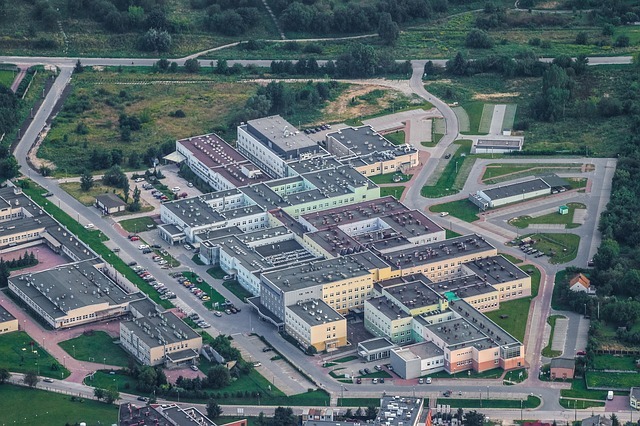 These wastes include Liquid, solid or gaseous waste contaminated with radio nuclides generated from invitro (outside) analysis of body tissue/fluid, invivo (body organ imaging) and tumor localizations and investigations and therapeutic procedures. Food waste, i. e., left over food, fruit and vegetable peelings. Absorption through the mucus membrane. Infectious of particular concern biomedical these days, for which there is a strong evidence of transmission via the biomedical waste, are HIV virus and Hepatitis B and C. syringes and needles are especially very dangerous because they are often contaminated with patient's blood. Many pharmaceuticals used in hospitals are hazardous. They can cause intoxication from absorption through skin, mucus membrane and from inhalation or ingestion. Many catatonic drugs are extremely irritant and produce harmful local effects after drugs are extremely irritant and produce harmful local effects after direct contact with the skin or eyes in addition to the more serous genetic effects. They can cause dizziness, nausea, headache or dermatitis. Many chemicals can be toxic, corrosive, flammable, reactive and explosive or shock sensitive. The most common injuries are burns. Contact with skin, eyes or mucosa of the lung airways can provoke injuries. Chemical residues discharged in the sewerage system can affect the working of biological sewage treatment plants. Also may have toxic effects on the natural ecosystem of recipient waters. The type of injury caused by radioactive waste is determined by the among and type of exposure. This may start from simple dizziness (feeling about to fall), headaches, vomiting and may lead to genetic effects. Hazards from low activity waste may occur from contamination of external surfaces of contamination of external of containers or improper storage. The risk waster should be segregated at the point of generation from Non-risk waste. It is useful for safe disposal of risks waste. The risk waste is separated from non-risk waste which accounts for 20% of the total medical waste. At source segregation minimizes the chances of infection and injury to the persons who handle the waste. For the different types of waste separate containers are required i. e. risk waste sharps and non-risk waste. All the different colored containers limed with plastic begs are placed in each ward and department. The person responsible for waste handling must do source segregation to reduce the chance of infection and lesser amount of waste to be incinerated. Segregation must be practiced from the source of generation to handling, transportation till the final disposal. The following steps should be observed. All categories of risk waste other than sharps are collected in "white color" container lined with plastic bag. When the plastic hags, and immediately replace it with a new plastic beg, and immediately replace it with a new plastic bag. The bags are sealed and labeled on site with the name of ward and location. The sharps are stored in "Red" color hard plastic container lined with a plastic bag. The medical staff cuts the needles of syringes making it unfit for reuse. If the sharp container is to be incinerated, it shall be placed in the yellow waste bag with the other risk waste. Large quantities of pharmaceutical waste shall be returned to suppliers. Small quantities may be placed in a yellow waste bag, preferably after being crushed. Radioactive waste may be placed in large yellow container or drum and may be marked with "Radioactive" waste. Non infectious radioactive waste may be placed in white bags. The non risk waste is stored separate from all other waste and is collected in a "Blue" container with a plastic bag lining. The blue containers should be located in the corridors open spaces and other visiting places etc. 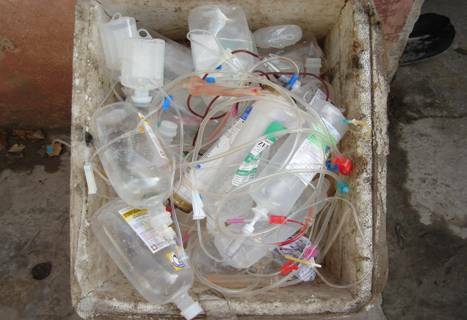 All the containers in hospital wards and department should be capable of handling waste with out spillage or puncture. The 40 liters capacity containers well are sufficient for one day storage. The containers will be of hard polythene materials.